It's 1940, and British soldiers have just been evacuated from Dunkirk, but Dodo (Dorothy) Revel and her younger brother Wolfie, 8, still haven't heard from their Pa, Captain Revel. When a telegram arrives, Spud, the children's housekeeper, tells them the sad news that their Pa is missing. Later that night, however, the children overhear Spud talking to someone that seems to indicate something else about Pa.
Next thing Dodo and Wolfie know, they are being evacuated to Dulverton, North Devon. Billeted with a reluctant woman whose son is off fighting, their only relief is at school with their kind teacher Miss Lamb. One day, on their way home from school, Dodo and Wolfie find a newborn foal. For Wolfie, it's a miracle. Pa had loved horses and knew a lot about them, much of which he had already taught Wolfie. Dodo and Wolfie decide to hide the foal, now named Hero for Captain Revel, with the help of a local boy named Ned. When word breaks that Captain Revel is being charged with desertion and disobedience at Dunkirk, Mrs. Sprig decides she can't have his children living with her. Luckily, they end up with Miss Lamb and her elderly father, Rev. Lamb. There is even a place for the growing Hero there. Life is better with the Lambs, though not at school. The whole nation is following Captain Revel's court-martial and his children are bearing the brunt of people's anger. It is a slow process and as time goes by life gets harder, with increasing shortages and rationing. Hettie Lamb has been watching over a small herd of Exmoor ponies, which are slowly disappearing. During a particularly cold snowy winter, the ponies are rounded up, and, along with Hero, put into a pen where they can be fed. But one night, the ponies and Hero disappear. Wolfie is devestated. When Rev. Lamb dies, Hettie is told she must move and so the three of them go to live in County Durham, a coal mining area in Northeast England. There, Dodo gives art lessons to the children of a coal mine owner, while Hettie teaches school. The war has now ended and Captain Revel is serving a two year sentence and still hoping to have his name cleared. He had always worked to improve condition for coal miners, and now, even in prison is continuing that work. But when the truth about Ned, the boy who had helped Wolfie with Hero back in Dulverton, and the shady activities he had been bullied into doing by his father come to light, things begin to change. Is it possible the Ned holds the key to what happened to Hero? 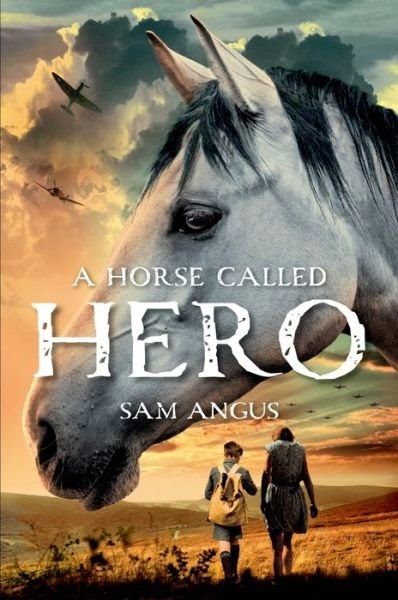 I really enjoyed reading Sam Angus's novel Soldier Dog when it first came out, so I was excited to read A Horse Called Hero. And I wasn't disappointed, it is a very compelling, though somewhat predictable, story with lots of coincidences. What is nice about this story are the glimpses the reader gets into so many aspects of life during the war. There are the pacifist demonstrations in Knightsbridge the children witness while out shopping with Spud. Sometimes we forget that not everyone supports war. The crowds of children and parents on Praed Street heading to Paddington Station was palpable. And although evacuation was difficult under the best of circumstances, Dodo and Wolfie's story show how absolutely capricious the whole process was. Mrs. Sprig was a horrible, narrow-minded woman with friends just like herself and wasn't able to really welcome these two scared, displaced children into her home. It makes one wonder how often that or worst happened in real life. However, Angus draws a lovely picture of the relationship between Wolfie and Captain Revel in the letters exchanged throughout the war, much of which was advice on caring for a horse. Wolfie's hero worship of his father is touching, never flailing even when the circumstances surrounding Captain Revel's arrest are revealed. Captain Revel was clearly a very compassionate character and it is one of the best fiction father/son relationships I've ever read. The reader also learns so much about what life was life for coal miners and the pit ponies, as they were called. These horses pulled tons of coal out of the mine each day, never seeing daylight once they were deep in the mine. The men and horses labored under dangerous conditions and that was what Captain Revel was working to change. Two things did bother me - we never find out how old Dodo is, only that she is older than Wolfie. And a map showing the relationship of London, North Devon and County Durham would have been nice (maps are almost always nice in historical fiction). But, in the end, the novel really asks the readers to consider what makes a hero. For that, it is a novel well worth reading. I thought I commented on this post the other day, but I don't see it here- so I will try it again. This sounds like an interesting book. I had no idea that horses were used in coal mining. Fun to learn something new. The novel seems to end with an interesting question. Thanks for sharing!